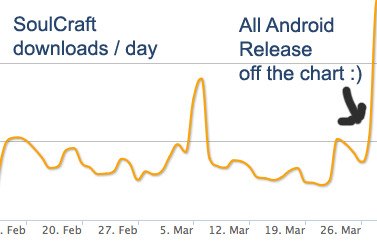 We were pretty happy with the downloads of SoulCraft before the "All Android release SoulCraft 0.6" but yesterday was really amazing for all of us here at the SoulCraft team. As you can see on the chart below - SoulCraft really took off - thank you very much for all the interest to help us in this Open Beta! Have fun and keep the bugs coming - thank you!! !